Note: This section pertains to Scatter Plot graphs only. Curve fits cannot be applied to Time Series graphs. When data is displayed in a Scatter Plot, it can be useful to include the equation of a line for the purpose of predicting values that may not be shown on the graph. It can also help in visualizing trends from a large array of data points. With your graph open, click from the Graphing Toolbar. A drop-down menu will appear. Click . The Curve Fits window will open. Click . The Curve Fits window will expand, revealing a few options. 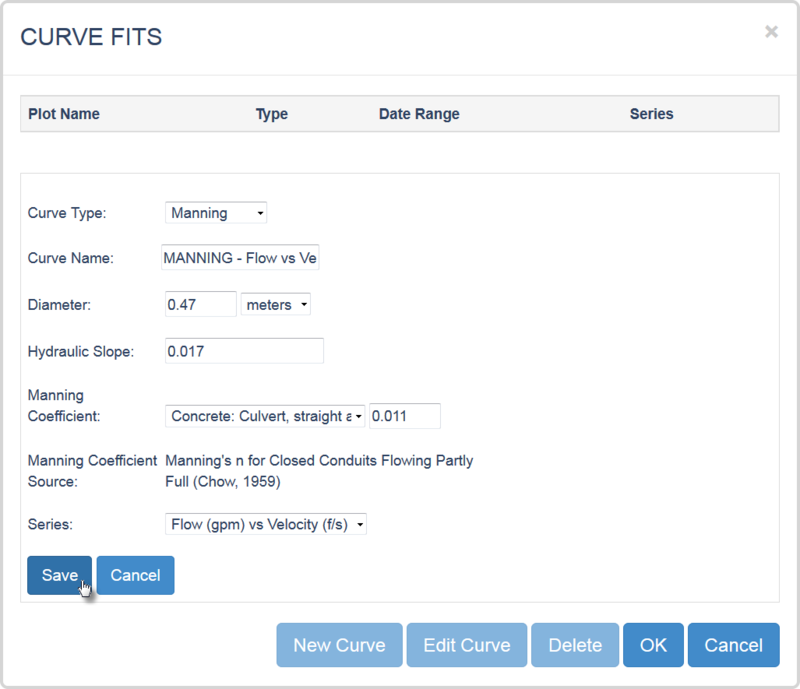 Choose a desired curve type from the Curve Type drop-down menu. Upon choosing a curve type, the window will expand to reveal options for your selected curve type. Each curve type comes with its own set of considerations, some of which you must know beforehand before proceeding (e.g. Manning Curve). 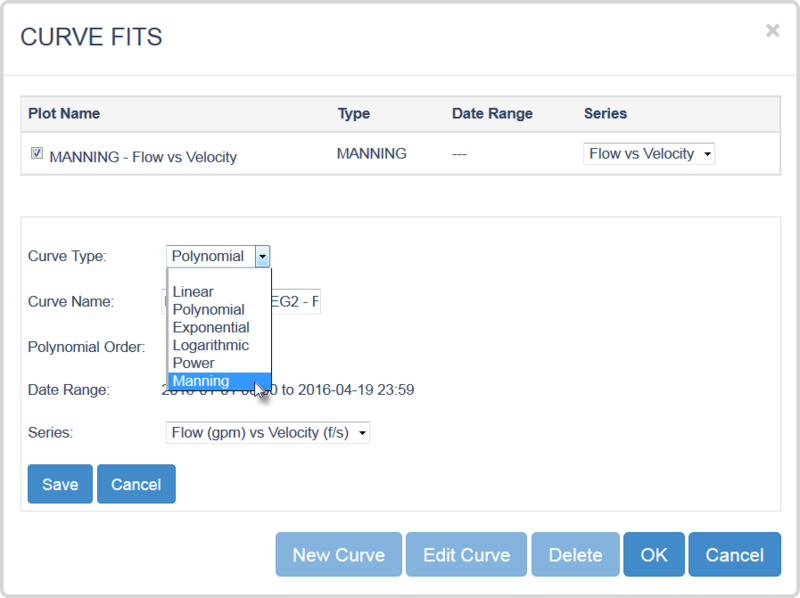 Set up the curve fit by completing the necessary fields below the Curve Type drop-down menu. Note: It is required that some prudent information for your curve fit be known beforehand. For example, creating a Manning curve requires that you know the diameter and materials of the associated pipe, as well as the hydraulic slope. To find out what information is needed for a curve fit, select a desired curve type from the Curve Type drop-down menu; the window will expand with a list of details needed to set up the curve fit. Click . The Curve Fits window will refresh, revealing the updated list of available curve fits, where your newly created curve fit will appear. Tick your new curve fit from the list. Click . Your graph will refresh, with the curve fit applied. 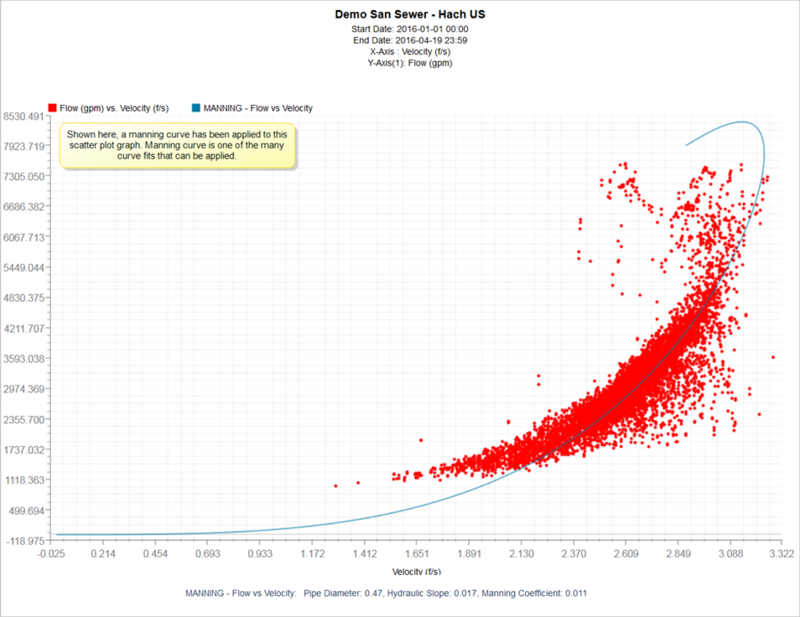 You can apply a previously saved curve fit to any of your Scatter Plot graphs. This saves time from having to redo a curve’s settings. Click . The Curve Fits window will open, revealing a list of existing curve fits. Tick your previously saved curve fit from the list.